Volume 1, Issue 8; February 21, 2001: Celebrate! 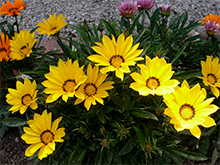 Treasure flowers (Gazania rigens) at Alcatraz Island. Photo courtesy U.S. National Park Service. How often do you celebrate? Chances are, not often enough. Most of us can remember to celebrate holidays (most of the time, anyway), personal events (birthdays, wedding anniversaries, divorces), and major career achievements (promotions, retirements, and the occasional layoff). But there are many more events to celebrate, and when we take time to mark them with the reverence they deserve, life is a lot more fun. Here are a few suggestions for celebrations that can lighten your workday. Buy (or pick) yourself some flowers. Get fancy if you want to. If you're having difficulty with this idea you're probably struggling with the image of carrying the flowers into the building from the parking lot in the morning. Not to worry, you can have them delivered. Maybe even ask the flower people to include a note: "With Love, George." Remember to sign your own actual name. If you can't adjust your hours, this one won't work for you. But even if you do have that freedom, you still face some serious challenges, because there are millions of excuses available. Fortunately, every excuse has a workaround. If you have too much work to do, pick a day when you don't, or take some work home, or shorten your lunch, or start a half-hour earlier. If you have to pick up the kids, that's no problem — just make sure you arrive wherever they are on time. The extra half-hour is still yours. Be creative. You just headed off a major confrontation, by pulling the right people together for some creative problem solving, and it worked. Even though others might not feel the need to make a formal celebration and hand you a plaque, you can do it yourself. It can be just you, or you can invite a few buddies. Probably you don't want to do the plaque thing though. We're so used to celebrating only the events that touch others, we can have difficulty celebrating the events that touch only ourselves. Like making it through the past seven days reasonably happy, or without missing a meeting. Or without assaulting that guy who unnecessarily dragged out yesterday's staff meeting by a half-hour. Appreciate yourself not only for the good things you do, but also for the bad things you don't. Would you like to see your comments posted here? rbrenuiGworYqMzZBazPvner@ChacWqbiYeoFmmIVMWtroCanyon.comSend me your comments by email, or by Web form. I offer email and telephone coaching at both corporate and individual rates. Contact Rick for details at rbrenjvnauWINXgKrHVyjner@ChacMcKjfxXLJFAmAGuaoCanyon.com or (650) 787-6475, or toll-free in the continental US at (866) 378-5470.